With over 900 deaths since March 25, the World Health Organization has declared this the worst Ebola outbreak in history, and governments around the world are acting to protect the health of their citizens. A nurse who had been treating Ebola in Lagos died from the virus, making her the second confirmed death in Nigeria, Africa's most populous country. In Sierra Leone hundreds of troops have been deployed to maintain quarantines and enforce the temporary ban on large public gatherings. Yet the precautions taken by the West African nations have not been enough to control the pandemic. A Saudi Arabian man who had recently returned from Sierra Leone died on Wednesday from a suspected case of Ebola, becoming the first death outside of West Africa. Saudi Arabia has since blocked visas from West African countries. Two patients have been transported from West Africa to a clinic at Emory University in the United States. Doctors at the Atlanta clinic, which was specially designed for controlling extremely contagious diseases such as Ebola, have started an experimental treatment on the two American patients (and it seems to be working). Spain is also attempting to repatriate one of its citizens. The priest, Miguel Pajares, will be treated at a hospital in Madrid after he arrives, the AP reports. Spain's Public Health General Director Mercedes Vinuesa has not announced details of when Pajares, who was treating people infected with Ebola in Liberia, will return to Madrid. On Monday, a New York man who had recently traveled to West Africa was isolated in the emergency room of Mount Sinai Hospital in Manhattan after presenting with early symptoms of Ebola -- high fever and gastrointestinal trouble. Tests later showed the man did not have Ebola. Saudi Arabia and the U.S. are not the only countries to be frightened by the spread of the virus outside West Africa. In Thailand, 21 tourists returning from West Africa are being monitored for symptoms of the disease. Thai Airways is taking precautions by screening passengers and disinfecting planes at five international airports. After a scare last week in which a woman returning from Kenya exhibited worrisome symptoms, Hong Kong officials are attempting to keep track of passengers arriving from all West African countries. There have also been scares at New York's John F Kennedy Airport, London's Gatwick Airport and in Paris. It seems Australia is one of the few countries not panicking; airport security has decided not to use additional screening procedures. 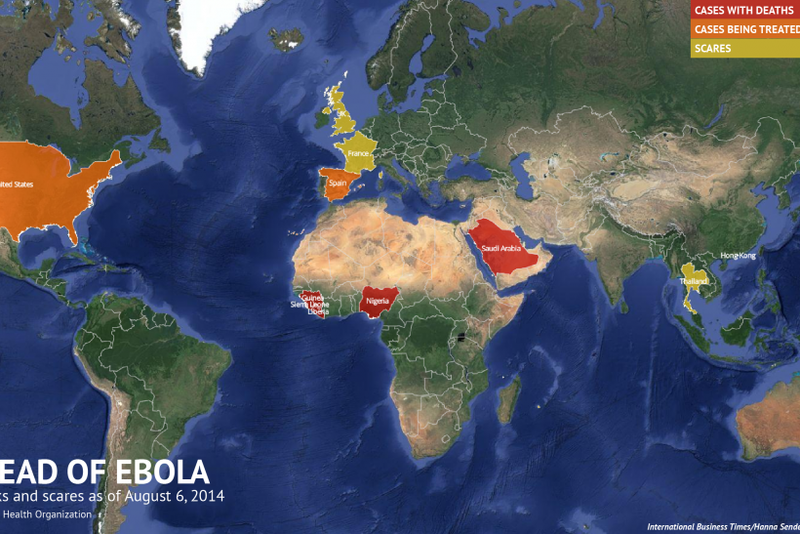 Take a look at the map to see where the outbreak has spread.